Who's to blame? It'll be interesting to see how Obama divvies up blame for the spill. There's growing evidence that BP took plenty of shortcuts in drilling the Macondo well, putting cost first and safety second. But government regulators deserve a sound lashing, too—for years, the Minerals Management Service has been way too cozy with the oil companies it was supposed to oversee, and Ken Salazar's plan to bust up the agency into two parts may not be radical enough. A deeper problem, as James Surowiecki argues in The New Yorker, has been that over the past 30 years the very idea of strong regulation has become de-legitimized. How's all that oil going to get cleaned up? It's less clear that there are a lot of brilliant ideas on this score. The Center for American Progress recommends putting the National Guard in charge of mopping up the oil (and planning for hurricane season, since a well-placed tropical storm will blow a lot of that sludge deep inland, killing off the Gulf marshlands). Likewise, a central clearinghouse for all the oil-spill information might come in handy—it's obvious that BP, which has consistently lied about how much oil was spewing out of the sea floor, can't be trusted to manage the info on this crisis. Still, there's no way to soft-pedal this: The spill is going to take a long time to contain, it's going to poison a lot of fisheries and coral reefs, and the crude's going to stick around for years, as it did after the ExxonValdez accident. There's only so much that "getting tough" on BP can accomplish here. Who pays for this mess? Under current law, BP has to pay all the cleanup costs, but only $75 million in indirect damages (which includes, for instance, wiping out the livelihood of shrimp farmers along the coast). Obama could call on Congress to lift this liability cap. Administration officials have also been talking about forcing BP to open an escrow account as big as $20 billion to compensate victims in the Gulf, instead of using that money to dole out scheduled dividends to BP shareholders. Can future spills be prevented? Now this is a vexing question. 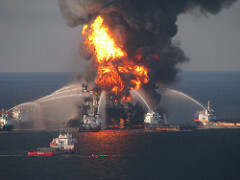 Is deepwater drilling inherently accident-prone? Or does it just need better oversight? Odds are, Obama will take the latter view. He'll probably push for a flurry of new regulations (regulation aficionados can see a long list here), and maybe require the sort of deepwater rig safeguards that other nations employ. Of course, that won't eliminate spills entirely: Just last August, an Australian rig blew out and flooded the Timor Sea with oil for ten weeks, so the Gulf disaster wasn't just a result of uniquely lax U.S. rules. Should offshore drilling be stopped altogether? In theory, Obama could argue that deepwater drilling is just too difficult and dangerous to allow and push for a new moratorium. But he'd get a lot of blowback from Gulf senators like Louisiana's Mary Landrieu. Plus, it's not like this addresses the demand issue. If we restrict offshore drilling in the United States but continue filling up our cars and tanks with endless amounts of gasoline, then that oil still has to come from somewhere. And it'll come from places like the Niger Delta, where Shell and other companies leak the equivalent of an ExxonValdez tanker into the water every year. Not exactly a feel-good option. So then how the hell do we get off oil? At a very basic level, the oil spill happened because we love guzzling oil. And the spills and accidents won't stop until we do. Fortunately, there's no shortage of good, wonky ideas to reduce our oil dependency, including Senator Jeff Merkley's recently announced proposal to, among other things: set strict new fuel-efficiency goals for cars and trucks, accelerate the introduction of electric vehicles, develop advanced biofuels, shift freight traffic from trucks to rail, and make homes in the Northeast more energy-efficient so that they need less heating oil. As Dave Roberts points outs, environmentalists have been so focused on getting a cap-and-trade bill that there hasn't been a strong constituency for a really ambitious oil-centric bill. Merkley's plan is an excellent effort. But hey, what about climate change? If all that crude bobbing around in the Gulf had never leaked out, but had instead been captured, refined, and burned in combustion engines across the country, it would still be heating the planet and causing a very different (and more gruesome) type of catastrophe. It's unclear whether Obama will try to make this connection or not—or whether he'll push for a price on carbon. As I noted yesterday, different administration aides seem to have different views on whether he'll go this far. (That's not surprising: As Eric Pooley's new book The Climate War details, White House advisers like Rahm Emanuel tend to think global warming is a losing cause.) But at this point, the only way the Senate is going to pass a bill that starts capping greenhouse-gas emissions is if Obama makes a powerful case for doing so. It's in his hands now.